Every square in the diagram below has a building of between 1 and 6 stories, inclusive. No two buildings in any row or column have the same number of stories. Also, on one of the diagonals, no two buildings have the same number of stories, though the other diagonal has a repeat. The numbers around the perimeter indicate the number of buildings visible when looking in the direction indicated by the arrow. Note that shorter buildings are not visible if they are behind a taller building. Determine the height of building on each square. 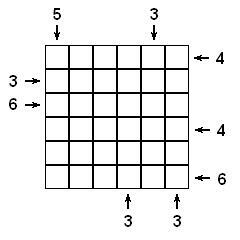 This puzzle was inspired by a puzzle on the Google Puzzle practice exam. There are two possible options but in both cases one of the conditions is not satisfied. Dont no what is wrong. But option2 seems to be logical but in this case two sets of buildings in one diagonal has same no of stories. Option2 would be the solution. Only thing is the diagonal does not have a repeat but two repeats.